(Nanowerk News) Bones are made up of tiny fibres that are roughly a thousand times finer than a human hair. One major feature of these so-called collagen fibrils is that they are ordered and aligned differently depending on the part of the bone they are found in. Although this ordering is decisive for the mechanical stability of the bone, traditional computer tomography (CT) can only be used to determine the density but not the local orientation of the underlying nanostructure. Researchers at the Paul Scherrer Institute PSI have now overcome this limitation thanks to an innovative computer-based algorithm. They applied the method to measurements of a piece of bone obtained using the Swiss Light Source SLS. Their approach enabled them to determine the localised order and alignment of the collagen fibrils inside the bone in three dimensions. Aside from bone, the method can be applied to a wide variety of biological and materials science specimens. The researchers published the result of their study in the renowned journal Nature ("Nanostructure surveys on macroscopic specimens by small-angle scattering tensor tomography"). The arrangement of the nanostructure of a three-dimensional object can now be visualised thanks to a new method developed by researchers at the Paul Scherrer Institute PSI. The researchers demonstrated this new approach in collaboration with bone biomechanics experts at ETH Zurich and the University of Southampton, UK, using a small piece of a human vertebrae that was roughly two and a half millimetres long. Bone consists of tiny fibres that are referred to as collagen fibrils. Their local three-dimensional order and alignment, which plays a central role in determining a bone’s mechanical properties, has now been visualised along the entire piece of bone. This novel imaging approach provides important information that could aid, for example, the study of degenerative bone disease such as osteoporosis. In general, the new method is suitable not only for examining biological objects but also for developing promising new materials. The data was obtained from PSI’s Swiss Light Source SLS, where the piece of bone was screened with an extremely fine and intense X-ray beam. This beam is scanned across the sample, recording data point by point. The interaction of the X-rays with the sample provides information about the local nanostructure at each measurement point. Until now, only two-dimensional samples could be scanned and examined in this way. Traditionally, the objects examined are thus cut into very thin slices. "But not every object can be cut as thinly as you’d want", explains project supervisor Manuel Guizar-Sicairos. "And sometimes when you cut it, you destroy or disturb the very nanostructure that you wanted to examine." Quite generally, a non-destructive method is preferable, leaving the object intact for subsequent investigations. In order to be able to image three-dimensional objects, the PSI researchers scanned their sample repeatedly, turning it by a small angle between each scan. This way, they obtained measurement data for all orientations that allowed them to subsequently reconstruct the three-dimensional object, including its nanostructure, on the computer. The new measurement method used by the PSI researchers draws on a basic principle from computer tomography (CT). CT also involves first taking many X-ray images of a patient or object from different angles and then combining them to form the desired images by means of a computer calculation. However, traditional computer tomography does not use a fine X-ray beam. Instead, the object is irradiated as a whole. While computer tomography can depict the varying density of the material, it does not capture details like the order and alignment of the underlying nanostructure. The latter only becomes possible through accurate measurement of the interaction between sample and X-rays which is enabled by the narrow, intense X-ray beam of the SLS in conjunction with state of the art detectors. The most complex step was to compile a computer image of the three-dimensional sample from the vast amount of data. To do this, the researchers developed their own sophisticated mathematical algorithm. "The X-ray beam always penetrates the entire depth of the sample and we only see the end result", explains Marianne Liebi, lead author of the study. "What the three-dimensional structure actually looks like is something we have to find out afterwards." Manuel Guizar-Sicairos and Marianne Liebi worked together to investigate a piece of bone and develop the complex algorithm for the evaluation of their data. For each point on the inside of the sample, Liebi’s algorithm searches for the structure that best corresponds to all the data measured. In the algorithm, the researchers took advantage of the fact that they could assume a certain symmetry in the arrangement of the collagen fibrils in the bone, thus reducing their data to a manageable level. Nevertheless, there still remained 2.2 million parameters to be found. These were optimised using a computer program that tests better and better solutions until it finds one that can best explain all measurements. 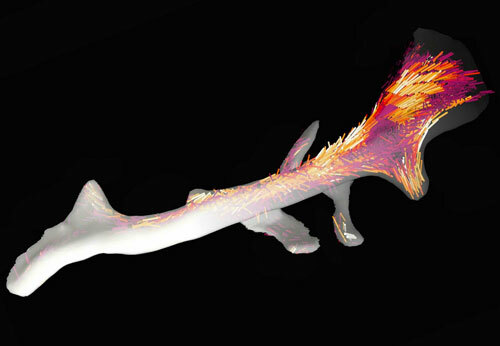 "I was amazed that after so much pure mathematics, an image emerged that really looked like a bone," said Liebi. "The details in it were plausible right away." While classic computer tomography generates greyscale images, the new method provides coloured images with considerably more information: The multi-coloured cylinders show the orientation on the nanoscale and even provide information on the degree of the orientation, which is high if adjacent collagen fibrils all have the same orientation and low if they are randomly oriented. "We can’t image each individual collagen fibril directly, but that’s not necessary anyway", explains Guizar-Sicairos. "Our imaging technique is akin to a map of vegetation zones. There too, one averages over certain areas, stating that one region is dominated by coniferous trees, another by deciduous trees and yet another by mixed woodland." In this way, it is possible to map the vegetation of entire continents without having to classify every single tree. By analogy it can be said that with traditional microscopic and nanoscopic methods this depiction of individual trees was necessary. That’s why until now, the smaller the structure of an object was the smaller the imaged section also had to be. Their new method allowed the PSI researchers to circumvent this limitation: From a piece of bone visible to the naked eye, they recorded the arrangement of the nanostructure in one single image. At the same time as their publication, Nature will feature a second publication with research led by another researcher team with Liebi and Guizar-Sicairos as co-authors. That publication ("Six-dimensional real and reciprocal space small-angle X-ray scattering tomography") introduces an alternative algorithm that leads to a similar result: The researchers were able to determine the three-dimensional internal nanostructure of a human tooth.